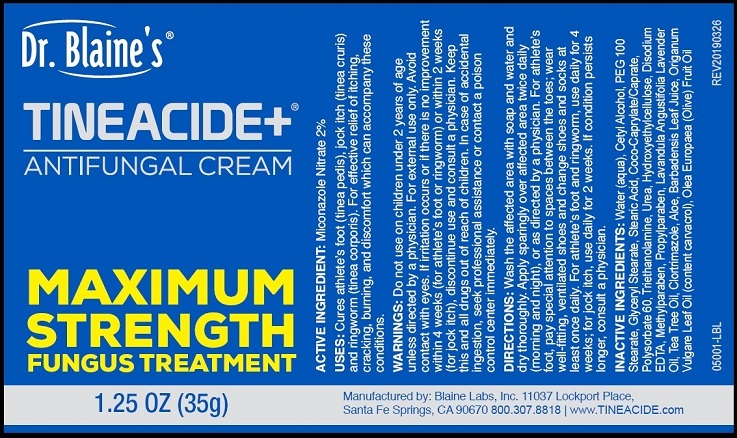 Proprietary Name: Tineacide Antifungal Maximum Strength What is the Proprietary Name? Non-Proprietary Name: Miconazole Nitrate What is the Non-Proprietary Name? 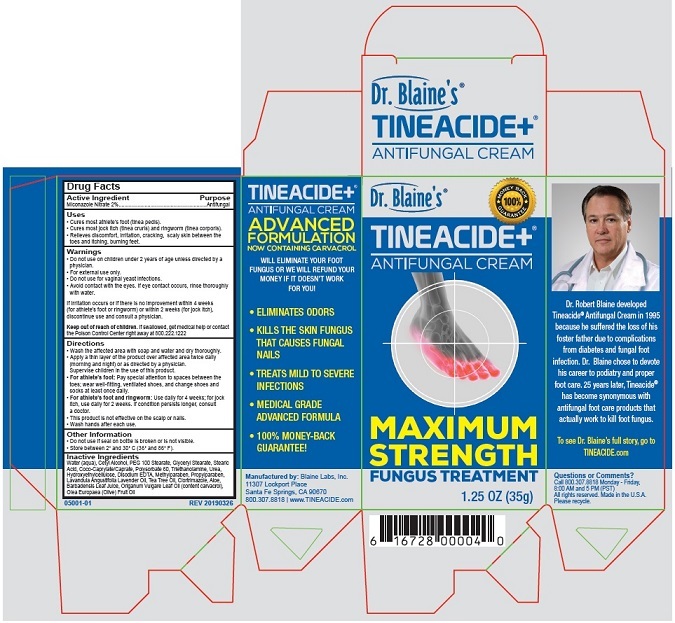 63347 - Blaine Labs Inc.
Tineacide Antifungal Maximum Strength with NDC 63347-503 is a a human over the counter drug product labeled by Blaine Labs Inc.. The generic name of Tineacide Antifungal Maximum Strength is miconazole nitrate. The product's dosage form is cream and is administered via topical form. Labeler Name: Blaine Labs Inc.
FDA Application Number: part333C What is the FDA Application Number? Uses• Cures most athlete’s foot (tinea pedis).• Cures most jock itch (tinea cruris) and ringworm (tinea corporis).• Relieves discomfort, irritation, cracking, scaly skin between the toes and itching, burning feet. Warnings• Do not use on children under 2 years of age unless directed by a physician.• For external use only.• Do not use for vaginal yeast infections.• Avoid contact with the eyes. If eye contact occurs, rinse thoroughly with water.If irritation occurs or if there is no improvement within 4 weeks(for athlete’s foot or ringworm) or within 2 weeks (for jock itch),discontinue use and consult a physician. Directions• Wash the affected area with soap and water and dry thoroughly.• Apply a thin layer of the product over affected area twice daily (morning and night) or as directed by a physician. Supervise children in the use of this product.• For athlete’s foot: Pay special attention to spaces between the toes; wear well-fitting, ventilated shoes, and change shoes and socks at least once daily.• For athlete’s foot and ringworm: Use daily for 4 weeks; for jock itch, use daily for 2 weeks. If condition persists longer, consult a doctor.• This product is not effective on the scalp or nails.• Wash hands after each use. Other Information• Do not use if seal on bottle is broken or is not visible.• Store between 2˚ and 30˚ C (36˚ and 86˚ F).